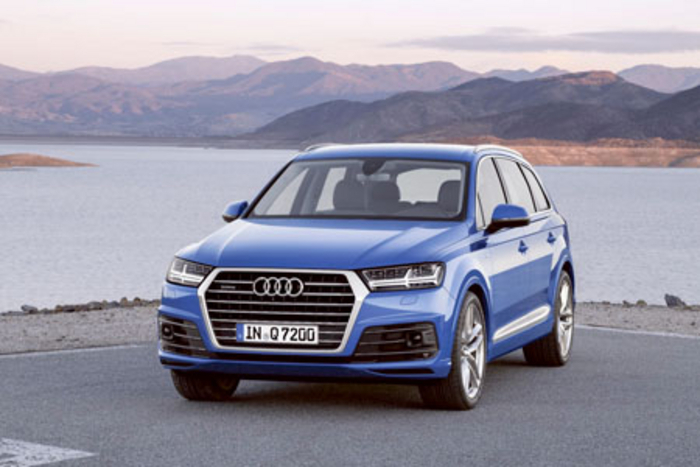 With the new Q7, Audi claims that it is setting standards in the premium SUV segment. For instance, 325 kilograms less weight and the lower centre of mass make it extremely agile. At the same time, it boasts that it is the most spacious car in its segment. And although the exterior dimensions have gotten smaller, Audi says that it offers substantially more interior room for passengers and luggage. Its innovative assistance and infotainment systems take the SUV to the front of the pack. The efficient engines consume 26 per cent less fuel on average. With a kerb weight of just 1,995 kilograms (as 3.0 TDI ), the new Audi Q7 is the lightest in its class. It weighs 325 kilograms less than the previous model. With its lightweight, multimaterial body and an all-new chassis, it is comfortable while at the same time offering the typical performance of a sporty Audi - and that with top-notch CO2 values. Audi engineers have reduced the fuel consumption of the Q7 by as much as 28 per cent (TFSI ) and 23 per cent (TDI ). The engines set top marks in the segment of large SUVs with all-wheel drive. The 3.0 TDI with 200 kW (272 hp ) and the 3.0 TFSI with 245 kW (333 hp ) accelerate the new Audi Q7 from 0 to 100 km/h (62.1 mph ) in 6.1 seconds (TFSI ) and 6.3 seconds (TDI ), respectively. The diesel V6 consumes on average just 5.7 litres of fuel per 100 kilometres (or 50 mpg ), corresponding to 149 grams of CO2 per kilometre (239.8 g/mi ). The Audi Q7 e-tron quattro, which will be launched a short time later, is the first plug-in hybrid from Audi with a diesel engine. It impresses with system 275 kW (373 hp ) of output and a system torque of 700 Nm(516.3 lb?ft ), and is also the world’s first diesel plug-in hybrid with quattro all-wheel drive in the premium SUV segment. It consumes just 1.7 litres per 100 kilometres (or 166 mpg ), which corresponds to less than 50 grams CO2 per kilometre. A full battery charge is sufficient for a distance of 56 kilometres.